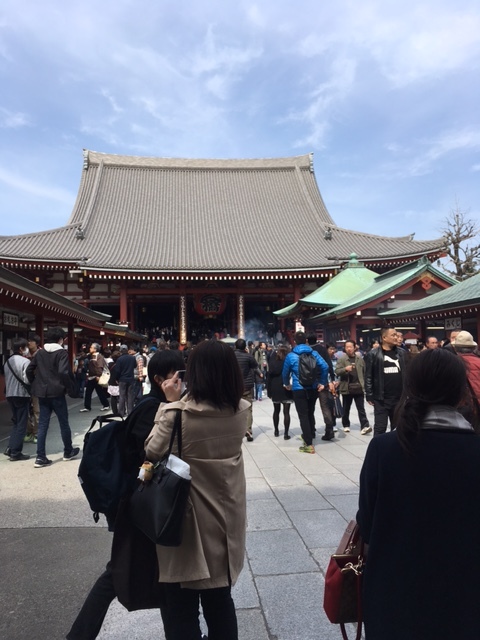 On our trip to Japan in March, on our list of places not to miss was Sensō-ji temple. WenYu, YaYu and I had been unable to see it when we visited Japan in 2015, so this time we were determined to go. 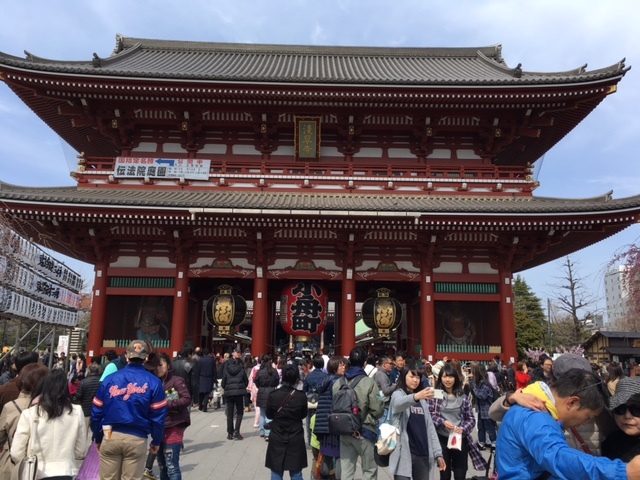 Not only is the shrine itself a fascinating and imposing site, and the surrounding neighborhood interesting as well, but we also knew we would be sure to find ramen shops there, and YaYu was determined to have a bowl of authentic Japanese ramen before we headed for home. 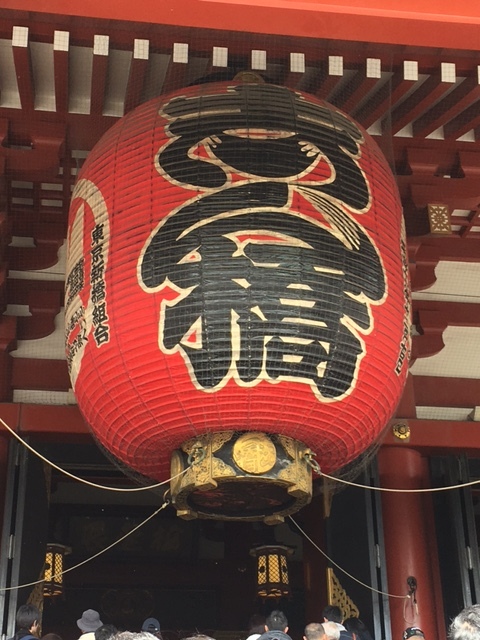 Located in the Asakusa district of Tokyo, Sensō-ji is the oldest temple in Tokyo. The temple is dedicated to Kannon (Guanyin), the Buddhist Goddess of Mercy, and is the most visited religious site in the world, with over 30 million visitors annually. The original temple was constructed in 645 C.E., but was bombed and destroyed during World War II. It was rebuilt following the war and is a popular destination for both Japanese and foreign visitors. Entrance to the temple grounds is free. The temple area was extremely crowded the day we visited, although we never found out why other than it was a nice spring day. It was difficult to take pictures as well as get through the crowd, and we missed getting to see the temple’s impressive five-story pagoda. Still, everyone visiting was polite and at times it seemed more like we were participating in a festival than visiting a religious shrine. After passing through the Kaminarimon, we headed down Nakamise, “Center Street.” It’s a long, straight road lined with souvenir shops on either side. There are lots of fun things to look at, but we didn’t buy anything (mainly because it’s mostly geared to tourists and overpriced). 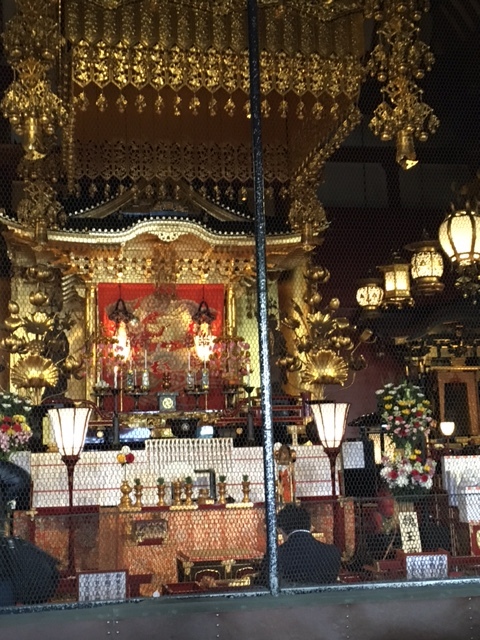 At the end of Nakamise is the Hōzōmon, or “Treasure House Gate.” It contains the second huge, distinctive paper lantern in the center, flanked on either side by two large black and gold lanterns. One the sides of the gate are two more of the large statues of gods -these two are Nio, the guardian deities of Buddha. Hondō, the main temple hall, is straight ahead and across a paved courtyard after passing through the Hōzōmon. We passed under a third giant lantern as we made our way into the main hall to view the altar. The lanterns at the temple are replaced around every 10 years. The interior of the main hall is protected from visitors, but you can still view the main altar. There was a ceremony being performed while we were there, but we could only watch for a few moments as there were long lines waiting behind us for their turn to view the altar. In the courtyard in front of the main hall is a giant brass urn where worshipers burn incense. 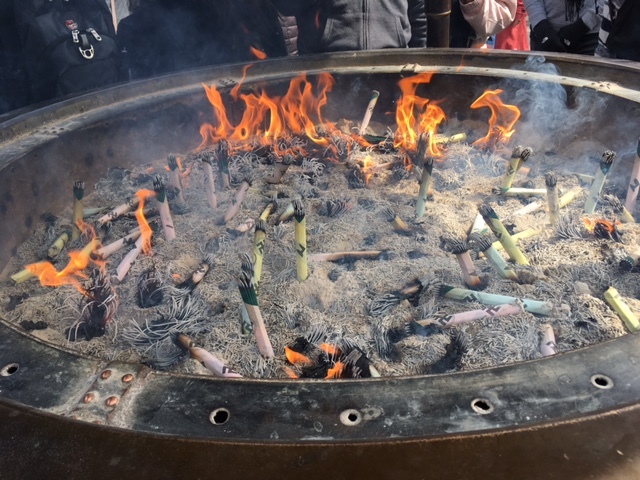 The smoke from the incense is wafted over parts of the body that are ailing, while prayers are said. Because of the crowds, we weren’t able to make it over to the pagoda, which is to the left of the main hall (photo courtesy of Wikipedia). 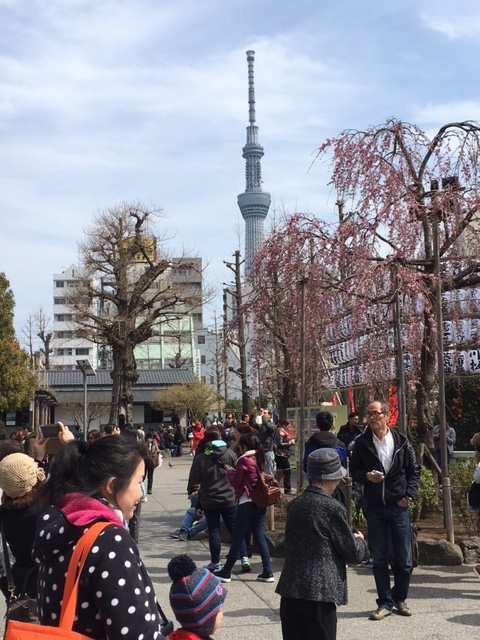 On the right side of the main hall courtyard visitors can catch a view of the Tokyo Skytree, the second tallest structure in the world. Completed in 2011, the tower is used primarily for broadcasting, but contains a restaurant and observation platform and is a very popular attraction in Tokyo. 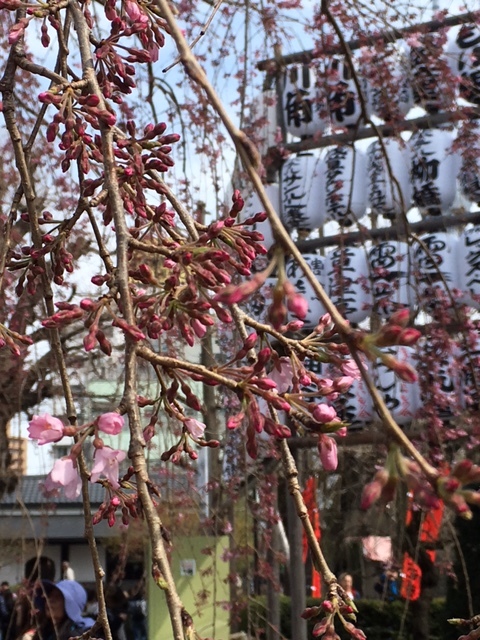 Cherry blossoms at the temple were just getting ready to open. 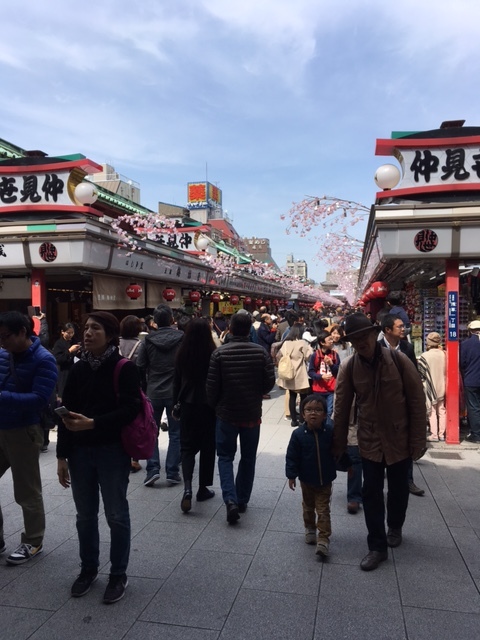 The Asakusa neighborhood is ‘old Tokyo’ and there are many restaurants and shops in the area serving or selling traditional foods and folk crafts. 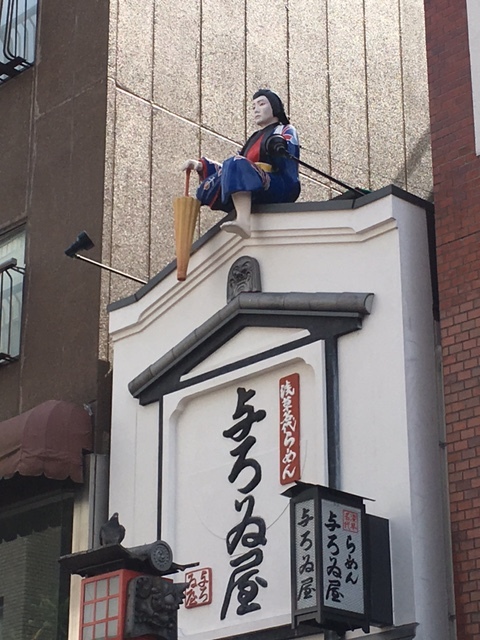 At one ramen restaurant, in an old-style building, a statue of a peasant from the past can be seen perched on the roof with his umbrella. 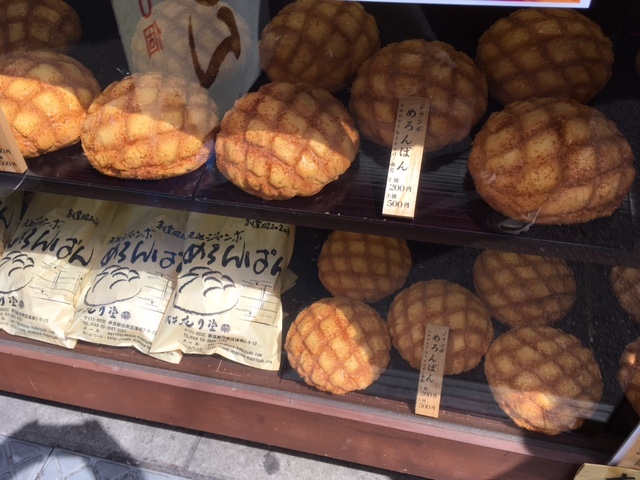 We saw several people carrying ‘melonpan,’ or melon bread, so called because its shape is reminiscent of a cantaloupe. These large loaves of sweet bread could be enjoyed plain, or split and filled with whipped cream. 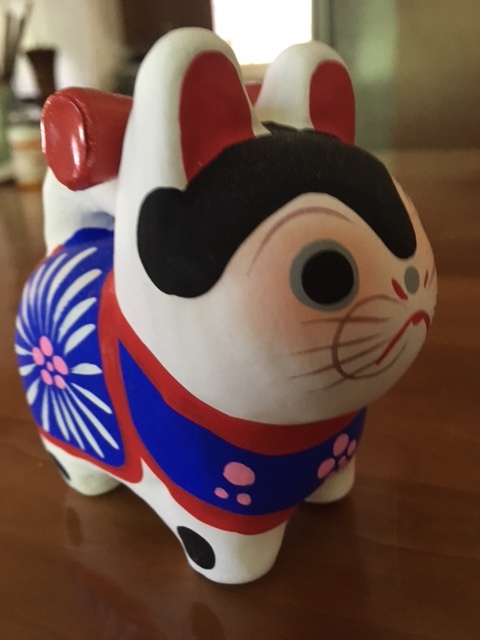 The little Inu Hariko figure I bought, my favorite Japanese folk character. He looks like a cat, but is actually a dog. We walked back to the main road, to get back to the station, down a side road that had the backs of the Nakamise souvenir shops on one side. One of the things I remembered from past visits to Sensō-ji was a wonderful gelato shop at the end of this road, but when we got to the end we discovered the gelato place was no more. The small shop selling folk toys and paper that I remembered was still there though, and I bought myself a small Inu Hariko made of papier-mâché. Back on the main street we found a ramen restaurant, and after standing in line for a while were finally seated. YaYu and Brett both got ramen, and I ordered stir-fried pork and cabbage – delicious! Our outing was an adventure, a very Japanese one with the crowds of people present, but well worth the effort. 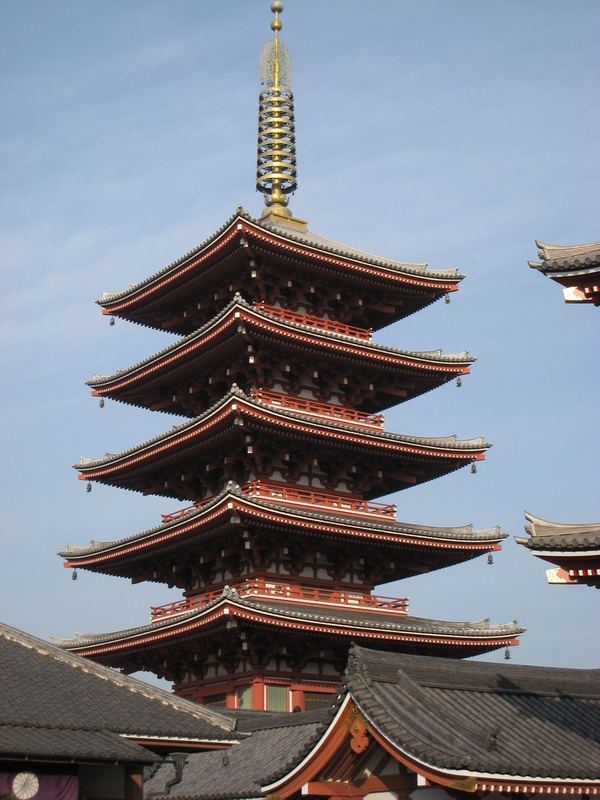 We were all glad we had gone, and hope to go back again next time we visit Japan so we can see the pagoda. Nice post and pictures! Thanks for sharing. When I was there, the Tokyo Skytree wasn’t built yet. I was so surprised the first time I saw it, on the train from Narita into Tokyo. It took my breath away it was so tall. There’s no way on this earth though that I’d ever go up in it. Always love your Japanese posts and pictures. Can you tell me the difference between Chinese and Japanese cuisine. They sound very similar but I’m sure there are differences. I always thought ramen was Chinese. Chinese food is very popular in Japan, except for the spicy stuff. I’m not sure when ramen arrived in Japan, but yes, it originally came from China. The Japanese have made it their own though with their own variations. If I had to pick one difference between the two cuisines, it’s that Japanese food is “fresher” – lots of Chinese food is cooked in oil, where Japanese food uses different techniques that don’t alter the ingredients quite so much. There’s a great movie about ramen culture in Japan, Tampopo, It’s about the search for the perfect ramen broth. It’s an older movie, but if you can find it, with subtitles, it’s worth watching. 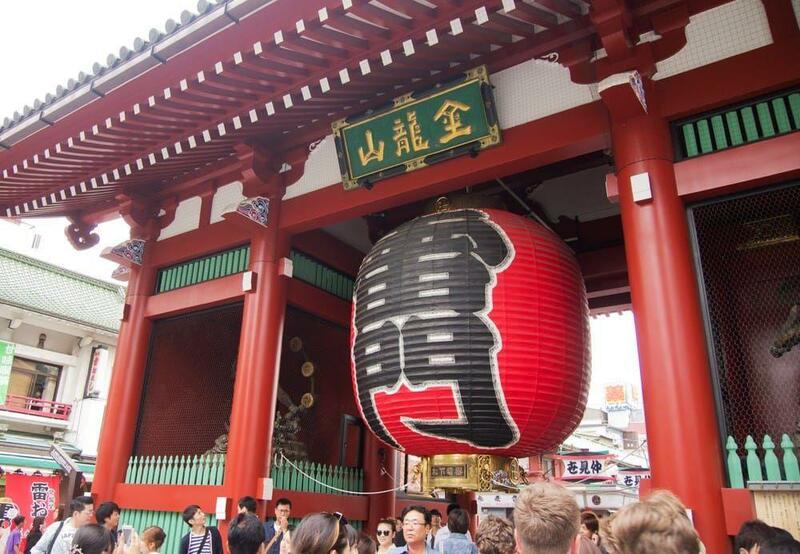 Thank you for this virtual tour around Senso-ji and the Asakusa area. It brought back memories. The area is always crowded when we visit, too. Still haven’t visited the pagoda. But when we visited Tokyo a year ago, we stayed in a hotel that was walking distance from Senso-ji. We strolled over there about 8 a.m. one day and for the first time got to see an almost completely deserted Nakamise-dori. It was kind of eerie because we were so used to seeing it jam-packed! Did you get any Kaminari-mon rice crackers? They are not my thing, but I usually end up buying some for omiyage. I LOVE Japanese folk toys and the Inu Hariko is my favorite. The one you got looks very cute! I have several Inu Hariko from trips to Japan, including three papier-mache versions, one stuffed animal keychain charm (from the Edo-Tokyo Museum, which has the Inu Hariko as its mascot), and a pair of hashioki (chopstick rests). I’ve been when it wasn’t so crowded. I didn’t think it would be empty the day we went, but was surprised by how many people were there. Everyone in Japan is so polite though, so no pushing or shoving, lots of “excuse me” and such being said. In the past I always bought sembe there, but this time it was just too crowded. Plus, I didn’t think there were as many shops selling crackers as there were in the past. I was happy to find the folk craft shop again, and find an affordable Inu Hariko – there were a couple of others I liked but too expensive. Besides my little figure I have an Inu Hariko notepad, eyeglass case, hashioki, and tenugui. I saw several other things this trip, but talked myself out of them!